The Alan Menken/Stephen Schwartz musical The Hunchback of Notre Dame started life as a 1996 animated film by Disney. It was based on the classic Victor Hugo novel about a deformed bell ringer in Paris’s Notre Dame Cathedral in 15th century France. The film featured a lush score by the Oscar winning composers and the vocal talents of Tom Hulce, Demi Moore, Kevin Kline and Jason Alexander among others as well as a trio of gargoyles, named Victor, Hugo and Laverne, to serve as comic relief to the main story of sexual frenzy and racial prejudice. In 1999, Menken & Schwartz augmented their score and with a darker book by Peter Parnell, a stage version opened in Berlin, Germany where it ran for three years. It wasn’t your typical Disney fare so the American premiere did not happen until 2014 at the La Jolla Playhouse which then moved to New Jersey’s Papermill Playhouse. Because of the large cast, including a choir of 30, and the dark material, Disney never took it to Broadway. 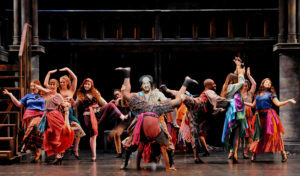 Instead it was released to regional theatres and Glenn Casale directed a stunning production in 2016 at Sacramento Music Circus that then transferred locally to La Mirada. 5-Star Theatricals is currently presenting the Ventura County Premiere at the Kavli Theatre in Thousand Oaks. It’s a testament to the strength of the material that the production is able to rise above the mediocre staging and mostly uninspired tech aspects on display. Misti B. Wills’s pedestrian direction usually presents her principals center stage front for all their numbers. Her pacing stutters and stumbles along. 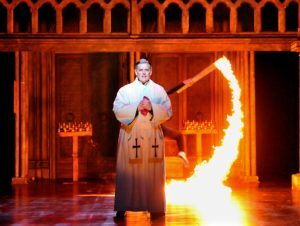 Michelle Elkin’s choreography is frenzied but undisciplined and why are there two half-naked men frolicking in “Hellfire,” Frollo’s fever dream of ravishing Esmeralda? Beth Glasner’s costumes at times looked so modern I thought the tale was being told to a tour group visiting present day Notre Dame. Jose Santiago’s lighting was lackluster. Thankfully Musical Director/Conductor Dan Redfeld’s 15-member orchestra made the score soar and Jonathan Burke’s sound design made every word and note crystal clear. The beautiful voices of the 30-person choir (represented by a dozen onstage and the rest backstage) give the score the heft to make it nearly operatic at times. 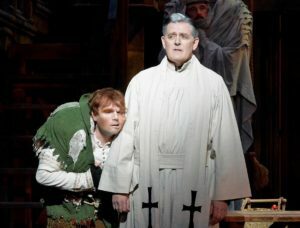 This Hunchback may not ring the bells, but if you have never seen a production, it is worth a look and listen. For those unfamiliar with the book or the many and varied film versions, the story features a man, Dom Claude Frollo, usually portrayed as a judge or a religious leader as he is here, who has an innate hatred for the Gypsy population of Paris. He has taken under his wing, a deformed child, here the offspring of his profligate younger brother and a Gypsy woman. He cruelly names the child Quasimodo (half formed) and keeps him out of site ringing the bells in the towers of Notre Dame. The subservient Quasimodo finally rebels as any teenager would, and decides to venture out among the Parisians on the annual Feast of Fools, where because of his hideous appearance he is crowned king and ridiculed by the people. 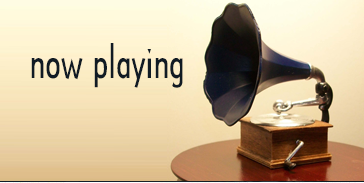 He is rescued by the Gypsy dancer, Esmeralda, who takes pity on him. He develops a crush on her while she has also attracted the lust of Phoebus, newly appointed Captain of the Cathedral Guard, as well as Bishop Frollo. Will North does a credible job of portraying Quasimodo as he scampers all over the multi-level set (uncredited in the program but actually designed by Stephen Gifford in 2016 and seen in all its splendid glory in La Mirada). He is in fine voice for “Out There” and other numbers, but his performance in mostly surface, not much subtext. 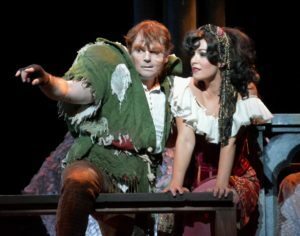 Adam Hollick manages to give some depth to Phoebus, the boy toy of the Gypsies, tramps and thieves. 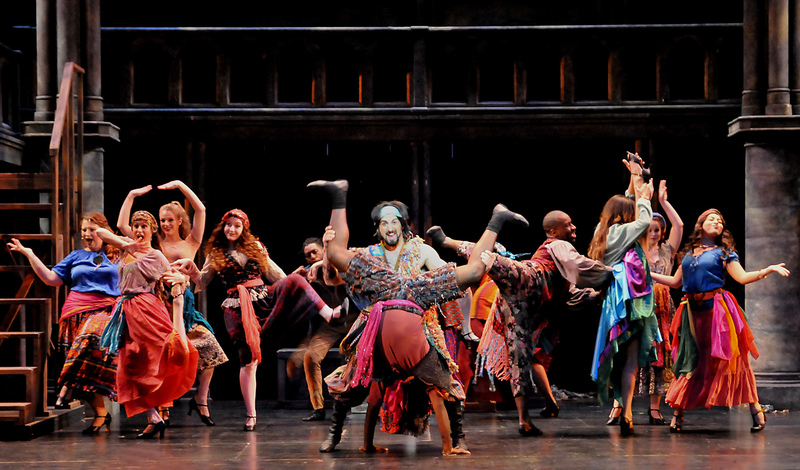 John Michael Wilcox displays a lot of energy as Clopin, King of the Gypsies and the teller of the tale. Greg North creates a layered performance as the conflicted Dom Claude Frollo. His hatred for the Gypsies is fueled in part by his love for his deceased brother. He’s a villain but doesn’t quite know it until his unexpected lust for Esmeralda takes him by surprise and overwhelms his rational mind. Carnality is new to this chaste and pious man and he is not able to control his emotions when it comes to all things Esmeralda. 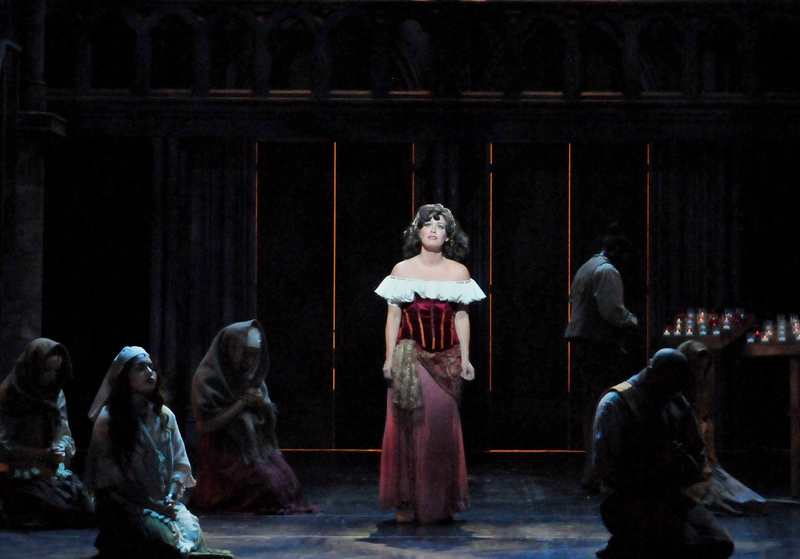 Cassandra Marie Murphy dominates the production as her character Esmeralda easily enraptures three men at once. She may not be a witch as Frollo claims, but she is bewitching. Her innate kindness and sympathy are what make all three suitors flock to her like moths to a flame. Some bask in her glow while others ignite. Murphy possesses a strong singing voice and her “God Help the Outcasts” is the show’s highpoint. She also has a tender and endearing duet “Top of the World” with Quasimodo that is deeply touching.